This is an archived article from my now-defunct NeonReviews website. Any qualities and/or information provided about the reviewed item must be seen in context of when it was originally published. They should’ve called it Big N’ Sloppy, or even Big N’ Nasty, because that was the case of what I was given in a box over the counter. The “special grill sauce” I was promised had a tendency to drip over my white shirt and messed up a lot of the table. I didn’t taste as good as the other burgers they have on their menu, either. 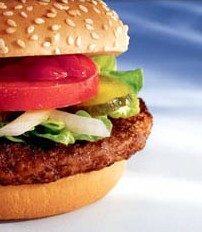 If you’re hungry, and have selected McDonald’s as your food choice, you’d be better off with the Quarter Pounder. That’s what I’ll pick the next time I drop by. Posted on 05.11.2003 at 00:00, categorized as food, reviews.